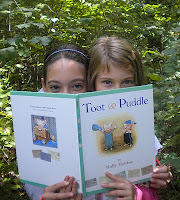 The Big Sister: "Toot and Puddle remind me of my sister and me. It was my favorite book when I was three, actually is still kind of is! Before my sister was born I named her Toot (when she was in my Mom's belly!) We all still call her Toot sometimes. I love that Puddle loves being home, just like me! The stories are really fun to read and I recommend them to all ages." The Little Sister: "I like Toot and Puddle! I remember that my Mom read them to me when I was little and now my sister reads them to me. I like Toot best, I want to travel like Toot --here are the places I want to go Egypt, South Africa, South America, and Paris." "Presenting Puddle at Pocket Pond! The Dad: "Simple, I love this book because it reminds me of being young." The Mom: "Toot and Puddle, the original book, is a favorite that I can read over and over and over and over and over and over and never get tired of it. Between Hollie Hobbie's illustrations or her clever crafting of a story that appeals to young and old. Whether you are a world traveler, like Toot, or a homebody, like Puddle, there is something for you in this timeless tale of friendship. 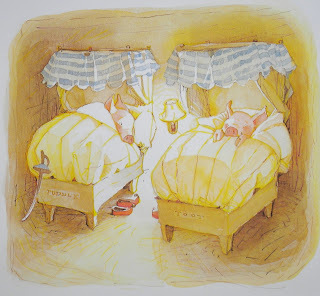 Toot and Puddle made bedtime simple: the end is perfect, with the buddies saying goodnight to each other. It made it easy to close the book say good night to the sisters. I always imagine the sweet dreams of travel and home in their little heads..."
For more on Hollie Hobby, and yes, as in the Hollie Hobby doll (she is the doll's creator) click here. The Mom owned an "Amy" doll --in fact still has it somewhere! 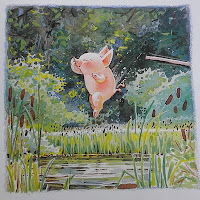 Go to www.worldcat.org and find a copy of Toot and Puddle, and "Ole!"! We love Toot and Puddle so much! And, big sister, I'm a homebody too. . .
We recently discovered two books by Holly Hobbie at our libaray: "Fanny" and "Fanny and Annabelle". They are not quite as timeless as Toot and Puddle, but pretty sweet none-the-less. Have you seen them? Fun! We have not, have to look for them at the library! !